Thanks EasyFrame for featuring me on your website and Facebook page. Much appreciated! I’ve used the services of EasyFrame for a few years now. It’s great. You just measure your work, choose mounts and frames, and place your order. 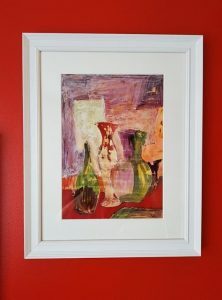 You can even upload an image of your work onto their site and select various mounts and frames to see what looks best. The goods arrive carefully packed within a few days and you get several pre-delivery alerts. 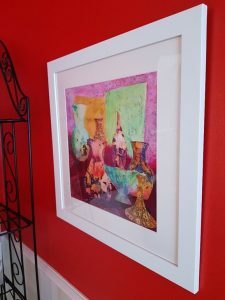 Included in the price of each mount + frame are: the mount, the frame, premium acrylic glazing, backing board, fixings and cord. The products are of good quality and easy to handle. They offer a multi-buy discount for custom frames of the same type and size. Their customer service is good with quick response times. Recently, two frames arrived with crushed corners. I’m not sure whether this was down to the packing or transport but EasyFrame immediately dispatched two full replacements which arrived a couple of days later. On another occasion I had completely messed up the positioning of some adhesive circles supplied with a floater frame, so I emailed EasyFrame and they popped some more in the post for me. The website contains useful detail on measurements and how to measure accurately along with plenty of general advice and suggestions. Below are two examples of frames by EasyFrame.